It was good to have so many along to the lecture on Monday, June 1. 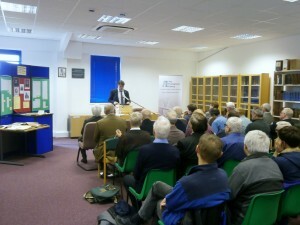 Around 40 were present to hear an excellent lecture. We had originally asked Dr Peter Beale to speak but he has been struggling with ill health and so had to decline (although it was nice to see him and his wife Lucy at the meeting). Dr Digby James kindly stepped in late on but was able to give us a well informed and informative and interesting life of Richard Baxter, who was born in 1615 (and died in 1691) bringing out very well both his strengths (his work in Kidderminster, his eagerness for Christian unity, etc) and weaknesses (some of his doctrinal views) and some of his idiosyncrasies. There was also a helpful section on his writings. A recording was made of the lecture and can be had from the Library. We hope to publish the lecture in the next In Writing in the Autumn.